A funny name for a really great-tasting dish. Bubble and squeak is a traditional English food, named for the way the cabbage or Brussels sprouts “squeak” in the pan while they cook. It’s basically like a potato cake stuffed with other vegetables, and is a great way of using up leftovers! Traditionally, you would use mashed potatoes and Brussels sprouts, but cabbage, carrots, and any number of other vegetables go well too. If you’ve got roast parsnips or green peas sitting in your fridge, mash them up and chuck them in! 6 large potatoes, peeled if desired, cut into chunks. 1 large handful Brussels sprouts or cabbage (Savoy cabbage works best), washed and shredded. Any other leftover vegetables, mashed. If you’re using leftover mashed potatoes, skip this part. Otherwise, place your potatoes in a large pot, fill with water and season lightly with salt. Bring to a boil, and boil the potatoes for about twenty minutes, or until very tender. Drain, and mash until there are no lumps. Place into the fridge or freezer to cool for a few minutes. In the meantime, toss your shredded Brussels sprouts/cabbage into a pan with a little bit of oil, and fry on medium-low heat until they start to soften. Add them and the rest of your veggies to the mashed potatoes, and mix well. Put some more oil in the pan, and heat it on medium heat. Season the potato-vegetables mixture, then form it into little patties. When the pan is nice and hot, fry them off a few at a time. Cook on each side for about three minutes, then serve. Another Middle-Eastern dish. Spelled many ways (Mulukhiya, molohiya, etc), it’s basically the leaves of the Corchorus plant, also called Jute leaves. You can find it at Middle-Eastern markets, and possibly in the more adventurous supermarkets. Don’t count on it, though. It tastes rather similar to spinach, so if you can’t find molokhia anywhere, frozen spinach can be a suitable substitute. 8 cloves garlic, peeled and minced, with half set aside. 2 cups long-grain rice (white or brown). First, get your rice going. Rice cookers are amazing, but if you don’t have one, just follow the directions on your rice. Different varieties of rice need more or less water, after all. Next, place the oil in a small frying pan and heat it on medium heat. We’re going to toast off half the garlic to make the dish very aromatic. Place the rest of the garlic, the frozen molokhia, and the stock in a pot on the stove on medium heat as well. You want to thaw the molokhia in the stock, that way it takes on more flavor. When the oil is hot, add your garlic. Be careful, the oil might splash you, so keep your fingers back! Stir it frequently, making sure it’s nicely toasted and golden brown on all sides. When it’s toasted, take it off the heat. Once the molokhia is thawed and starting to boil, add the toasted garlic along with the oil in the pan. Stir well, and let bubble for a few minutes. Serve the molokhia on top of a bed of rice, and enjoy! Another recipe I learned from my father – it’s similar to ratatouille, but uses green vegetables with more subtle flavors than your standard ratatouille. 1 bulb fennel, sliced into thin strips. 1 green bell pepper, sliced into thin strips. 3 cloves garlic, peeled and minced/crushed. 2 medium zucchini, sliced into thin quarter-moons. 2 medium leeks, sliced into thin half-moons. 1 large pinch dried herbs (tarragon or herbes de provence work well). Place the oil into a medium-sized saucepan and heat over medium heat. Add the fennel when the oil is hot, and cook, with the lid on, until it just begins to soften, stirring often. Toss in the garlic and bell pepper, stirring frequently. Once the pepper starts to soften, add the zucchini and the leeks. When everything starts to become fragrant and soft, toss in the herbs, stir well, and reduce the heat to medium-low. Cook until the zucchini are tender, then serve and enjoy! Cauliflower, Potato, and Pea curry. A family favourite, this vegetable curry is incredibly delicious and filling. One recipe’s worth will leave you with plenty of leftovers, which is great! You might find this dish a bit spicy (I used to, until I got used to spicy food), so if you have a low spice tolerance, you might want to reduce the amount of peppers you use. This dish is also great when eaten cold. 1 head cauliflower, cut into small florets. 2 large potatoes, peeled if desired, cut into bite-sized chunks. 1/2 cup light vegetable oil. 2-3 tsp red pepper flakes (don’t overestimate yourself!). 1 1/2 cups green peas (frozen work great). 1/2 can tomatoes (if you’re using whole, puree them before using them). In a large pot, heat the oil over-medium high heat. Add the spices and fry for a few seconds, then quickly add the cauliflower and the potatoes. Fry for about 5 minutes, stirring constantly, until the vegetables begin to brown slightly. Next, add your tomato puree, and stir everything well. Fry for about three minutes, until the sauce begins to thicken slightly. Add the boiling water along with some salt. Reduce the heat, and allow everything to simmer, covered, until the cauliflower and the potatoes are cooked through, about 15 minutes, stirring often. Add the frozen peas, and cook for another 5 minutes, or until the sauce is nice and thick. Serve hot, and enjoy. A slow-cooked lentil stew of Indian origin, this dish is great to cook in large batches. It can be eaten on its own for a light meal, or served as a side dish or appetizer with other curries and the like. Very tasty, and even better served with naan. 1/2 tsp salt, plus some to taste. approx 250 g red lentils, well-rinsed. 1 large bell pepper, diced. 2 large carrots, peeled if desired, finely sliced. 2 stalks celery, finely sliced. 1 large handful fresh coriander (cilantro). Heat the oil in a large pot on medium-low heat. Add your onion, garlic, and salt. Caramelize for approx. 40 minutes, until the onion and garlic are very soft and sweet. about 20 minutes into this, start cooking your lentils in a pot with the stock, and microwave the carrots, bell pepper, and celery in a bowl of water until they start to become tender, about 15 minutes. When the lentils are ready, add them along with the rest of the vegetables into the onion pot, stirring well to deglaze the bottom of the pot. Add your fresh coriander and cumin. Raise the heat slightly, until the soup is gently simmering, and cook for at least an hour. Risotto is incredible. It’s a super creamy, delicious rice dish that’s easy to customize. It has a reputation for being tricky to cook, but as long as you keep an eye on it and keep stirring it, you shouldn’t have any trouble! My dad taught me to make risotto when I was 14, and I’ve since adjusted his recipe to make it vegan. I’ve included two different variations in this recipe, since they’re both very yummy, but very different! You can add all sorts of things to risotto to make it interesting. Celery, peas, mushrooms, carrots… the list goes on and on. If you don’t drink alcohol, go ahead and add an extra cup of stock and a splash of vinegar to imitate the effect the wine has on the dish. 1 small onion, finely diced. 2 cloves garlic, crushed or minced. ~3 cups vegetable stock (may need more or less, depends on how the rice behaves). 1 small zucchini, thinly sliced into quarter-moons. 1 small yellow bell pepper, diced. 1 small handful dried mushrooms (porcini are the best, but a mixed variety is nice too). drizzle of truffle oil to garnish (optional!). Both of these risottos start out the same way: place a large saucepan on medium heat, and add the olive oil. When the oil is hot, add the arborio rice and fry for 2 minutes, stirring frequently. Next, add the onions and garlic and fry for another two minutes, stirring often to prevent everything from sticking. Add the wine and mix it into the rice well. Cook until the wine is absorbed into the rice, stirring often to make sure no rice gets stuck to the bottom of the pot. If you’re making the vegetable risotto, now’s the time to add the bell pepper. Add the vegetable stock in half-cup increments, waiting each time for the stock to get absorbed. Keep on stirring. Once two cups of stock has been absorbed properly, it’s time to add the zucchini, if you’re making the vegetable risotto, or the mushrooms, if you’re making the mushroom risotto. Keep adding the stock and stirring it until the rice is plump and tender. How much stock you’ll need to use with depend on your rice. Some brands need a lot of liquid before they’re properly cooked. Season with salt and pepper, and serve piping hot! If you made the mushroom risotto, drizzle a little bit of truffle oil (or olive oil) over the top to be fancy. Not a traditional curry in the least, but it’s yummy! The chickpeas add a nice amount of protein to this dish. This is also quite a quick meal to make, so it’s good for a weekday! 1 cup basmati rice, rinsed to remove excess starch. 1 can whole tomatoes, sliced, with the juice reserved. 1 Chinese eggplant, cut into half moons. 1 1/2 tsp curry powder. 1 cup vegetable stock or water. 1 large handful fresh basil, shredded. Place your rice in a rice cooker with the appropriate amount of water, a little bit of oil, and some salt, and turn it on. If you don’t have a rice cooker, then place the rice in a pot with 1 1/2 cups water, a little bit of oil, and some salt, and bring to a boil. Stir the rice once, then cover the pot, and reduce the heat to low. Cook for 15-20 minutes, until the water is absorbed, and then take the pot off the heat. Let it stand, covered, for about 5 minutes. While the rice is cooking, heat the oil in a saucepan over medium heat. Add the onion and cook until soft and fragrant. Then stir in the tomatoes, eggplant, and curry powder. Season with salt and pepper, and cook, stirring often, for about 2 minutes. Next, add the stock/water and bring to a boil. Reduce the heat and let it simmer for about 15 minutes. Add the chickpeas and hot sauce (if you’re using it), and cook until they’re warmed through. Remove the pot from the heat and add the basil. Fluff the rice with a fork, and serve the vegetables on a bed of rice. Enjoy! Very loosely inspired by a Thai dish I once had. If you can’t find Chinese eggplant, I’d just leave it out, since Italian eggplant wouldn’t work too well in this dish. Be careful not to overcook the rice noodles! They’ll end up mushy. This is a lesson I learned the hard way. 1 can unsweetened coconut milk. 3 green onions, thinly sliced, some set aside to garnish. 1 Chinese eggplant, cut into thin half-moons. 1 large handful Thai basil leaves (leave small ones intact, tear up the larger ones), plus some to garnish. Cook the noodles according to package directions. Drain, rinsing the noodles with a bit of cold water to prevent them from overcooking, and set aside. Place a large saucepan on medium-high heat, and add the sesame oil. When hot, add the scallions, and eggplant, and cook, stirring frequently, until they begin to soften. Next, add the coconut milk, tomato paste, and chili paste. Season with salt and pepper. Bring the mixture to a boil, stirring often to prevent it from sticking, then add the basil leaves and bean sprouts. Reduce the heat and simmer for about three minutes, until the sauce begins to thicken. Stir the rice noodles into the sauce and toss to coat well, and serve immediately, garnishing with a few extra basil leaves and the green onions. Yet another great recipe for fall and winter. I’ve got a long, cold season ahead of me, and I thrive off of soups and stews in the winter. This soup uses brown lentils, which can be kind of bland on their own, with a bunch of other vegetables to add plenty of flavour and nutrition! I recommend serving with bread. 4 leeks (use the white and light green parts, not the dark green parts), cut into thin half-moons. 2 stalks celery, thinly sliced. 1 can of whole tomatoes, sliced, with the juice reserved. 6 cups water or vegetable stock. 2 sweet potatoes, peeled and cut into small pieces. 1 bunch kale (thick stems removed), sliced into strips. 1 tbsp fresh thyme, removed from the woody stems. Heat the olive oil in a large pot over medium heat. Once hot, add the leeks and celery and cook until they begin to soften. Add the tomatoes and stir well. Cook for about 5 minutes, then add the stock/water and bring to a boil. Stir in the sweet potatoes, lentils, kale, and thyme. Season with salt and pepper, and simmer for approx 30 minutes, until the lentils and sweet potatoes are tender. 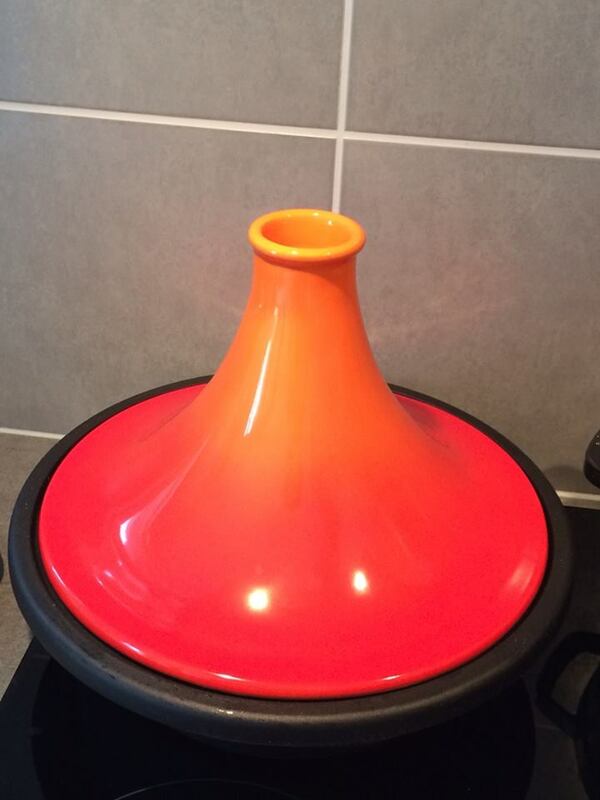 If you don’t have a tagine pot, don’t run out and buy one unless you really want to. You can just as easily make this dish using a large pot! This dish is traditionally served with couscous, but if you can’t eat gluten, use quinoa or buckwheat instead. If you don’t drink, use some vegetable stock and a splash of vinegar to imitate the effect the wine will have on the dish. ~350 g small potatoes, cut into chunks. 1 bulb of fennel, trimmed, and sliced into chunks. 1 medium carrot, peeled if desired, cut into chunks. 1 bell pepper (red, orange or yellow), seeds removed and cut into chunks. 1 large onion (red onion is best), cut into chunks. 3 cloves garlic, roughly minced. Slivered almonds to garnish (optional). Preheat your oven to 400ºF (approx 200ºC). Place the potatoes, fennel, carrot, bell pepper, and onion in a large roasting tray (lined with foil if you want easy cleanup) with 3 tbsp of the olive oil, the cumin, coriander, and fennel. Season with salt and pepper, then toss everything well until the vegetables are thoroughly coated. Roast the vegetables for 30 minutes, stirring twice to make sure they cook evenly, until the potatoes are cooked through. Meanwhile, heat a large pot over medium heat and add the last 1 tbsp of olive oil. When hot, fry the garlic until fragrant, then add the tomatoes, raisins, chickpeas, wine, orange zest and juice, wine, and the cinnamon stick. Bring the whole thing to a boil, then reduce the heat slightly and simmer for about 20 minutes. When the vegetables are done roasting, add them to the pot and stir well. Bring the tagine back to a simmer and cook for another 15-20 minutes. While the tagine is simmering, it’s the perfect time to roast off some slivered almonds and prepare some couscous. Place a small frying pan on low heat and add your slivered almonds. Toast them, stirring frequently to prevent them from burning, until they’re a nice golden colour. For the couscous, your best bet is probably to follow the directions on the package. I do recommend adding a little salt and olive oil to the water for a little seasoning, though! Serve the tagine on top of a bed of couscous (or couscous substitute), and sprinkle the slivered almonds on top. Enjoy!